Plans change....after studying my collection of available transformers I found one rated at 560 (center tapped) at 270mA. This would work well with a full wave bridge rectifier as the TZ-20 final stage B+ (550VDC). Half of this, full wave center tapped rectified, is about right for the buffer stage (270VDC) and a VR-150 should be able to take this down to 150V for the oscillator stage. dealing with a similar problem on a different transmitter. He suggested an "Economy Power Supply". 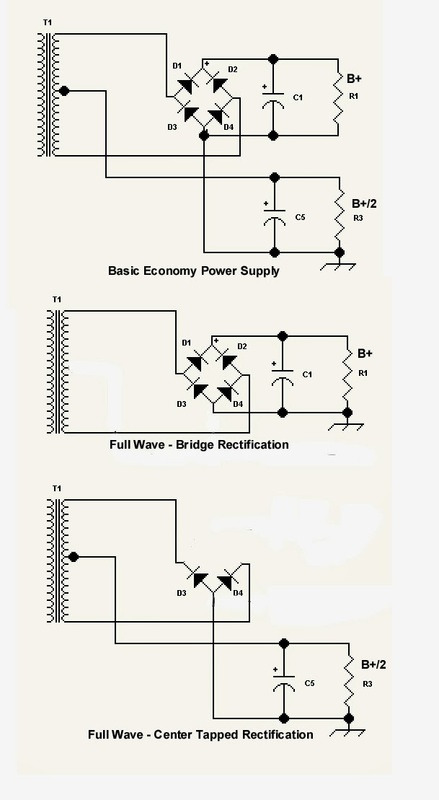 Rather than clone my one transformer it's possible to run it with both a full wave bridge rectifier and a full wave center tapped rectifier.This looks like it may work. I'm using PSU Designer II to help me play with filter options before I put solder to the iron. 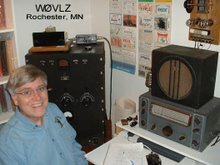 With my KX3 n the shop because of a bad output transistor and cool weather returning to SE Minnesota I'm again in the basement looking at boat anchor projects. One project on my list is to clean up the power supply for my 1939 transmitter. Right now I've borrowed the power supply from my 1951 novice station to power the oscillator/buffer stages and used a second 500VDC supply for the TZ-20 amplifier stage. Needless to say, these don't show up in my blog photos of the transmitter. My new power supply is a pretty brute force design delivering 550VDC, 300VDC and 150VDV to the transmitter using two power transformers, a couple of 5R4 rectifiers, a VR-150 and the needed filtering circuits. It will be two fairly heavy supplies on one chassis. I found all of the transformers and components in my junque box but not a stout enough chassis for all of the iron. I turned to my slat board design to take care of this shortage.